Robojackets 20th Anniversary Competition was hosted by Robojackets in the Georgia Tech student center on the 30th of March. 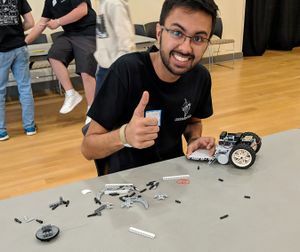 It consisted of beetle-weight battle bot, lego-sumo, and Roboracing competitions as well as a show case for our 120 pound bots Mandiiii and Cassowarii (middle-weight). We had some local teams attend as well as some from out of state. The beetle-weight tournament was fought as a Double-Loss Bracket Style tournament, where every team is guaranteed two matches. 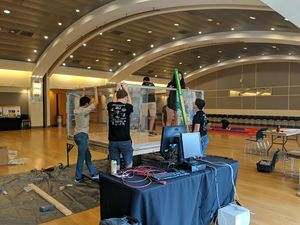 The overall winner of the Battlebots was the bot Dynastinei, an under-cutter three pound bot made by a Georgia Tech student and former Robojackets member. Almost all of Robojacket's three pound bots passed safety, and Crispi, Groovi, Doori, Unlucki, Entropi, and Furi all won a match (including by forfeit).